Fans were heard chanting “Chelsea rent boys” during the match, despite a push to clamp down on homophobic language. The club said: “The club is concerned about a chant from some of our fans, specifically referencing Chelsea, as inappropriate and offensive. On social media, Kop Outs wrote: “Most of our fans know the importance of supporting @LFC positively. 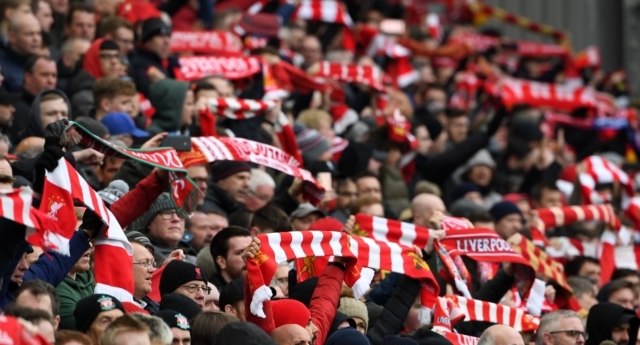 “At Kop Outs, we’re pleased that #LFC takes fan conduct seriously. According to previous reports, the “Chelsea rent boys” chant is thought to have originated in the 1980s after newspapers reported that, in a dawn raid by police, a Chelsea hooligan was found in bed with a male prostitute (or “rent boy”). Kick It Out, which works to combat racism, homophobia and discrimination in football, released a report in November that warned hate incidents are up dramatically year-on-year. There were 111 reports of homophobic abuse incidents around football matches in the 2017/18 season, a 9 percent increase from the previous report. Six transphobic incidents were also reported in 2017/18. Racist incidents remained the most prevalent, with 273 reported incidents over the past year, up 22 percent year-on-year. Kick It Out chair Lord Ouseley said in a release: “It is hugely disappointing to have to reveal, yet again, increasing levels of all forms of discriminatory abuse at football. He added: “Football cannot be complacent about the risk to the game this represents. Much good work has, and is, being done to prevent and counter unacceptable behaviour. But, the professional leagues and their clubs must do more in a coherent and consistent way – exemplifying all the best practices applied by some clubs – to drive hateful and abusive spectators out of the game.